There are many things that are iconically Scottish: kilts, bagpipes, haggis, porridge, bens, lochs, the Loch Ness monster... and highland games. Highland games are held all over the Scottish Highlands, which are the more mountainous regions in the north and west of Scotland. 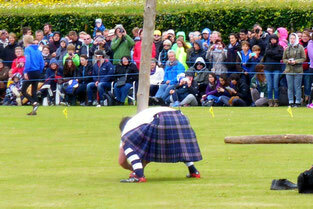 We went to watch highland games at Saint Andrews (famous for being the birthplace of golf), north of Edinburgh. Saint Andrews is on the North Sea and on the day we were there a blasting cold wind was blowing in. The games are held on a athletics and football field, so there is nowhere to get away from the wind. Take a look at the mid-summer clothing that the spectators are wearing in the introductory picture, above. The temperature was around 14°C, but I'd swear that I haven't been that cold since I was in Iceland, partly because I didn’t have all of my cold-weather gear with me. 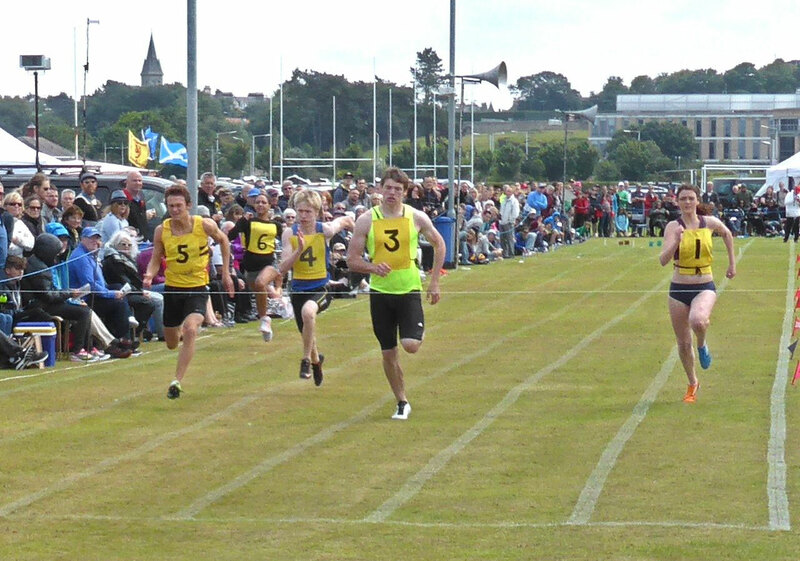 The highland games encompass a wide range of activities, including running, cycling, and heavyweight events. Here are sprinters about to cross the finish line. The young man in the middle was an extremely powerful runner - every muscle in his body worked toward speeding him forward. Notice the disparity amongst the competitors - there are males and females, and young and older, competing directly against each other; that's because all of the sprints are run as handicap races. It's interesting to see a man in his fifties given a start position twenty-five metres or more ahead of an eighteen year old - it's hard to believe when you see then on the blocks, ready to go, that that sort of head start could be made up in one-hundred metres, but of course, it is. This certainly makes you realise how fast the best of them are. This also results in a photo finish for every race. The cycling was unusual in my experience, in that it was performed on the grass athletics track. The bicycles were fixed-wheel track bicycles with no brakes, as you would see at a velodrome. An assistant supports the rider for starting. 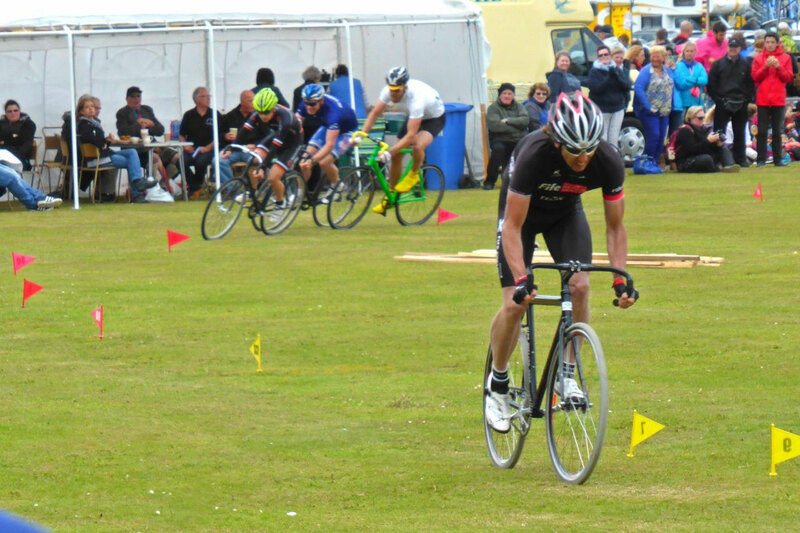 The bicycle may have had special tyres for racing on grass. While the sprinting and cycling were great to see, I wouldn't give my time in Scotland to them; it's the heavyweight events that are really the iconic part of the highland games. 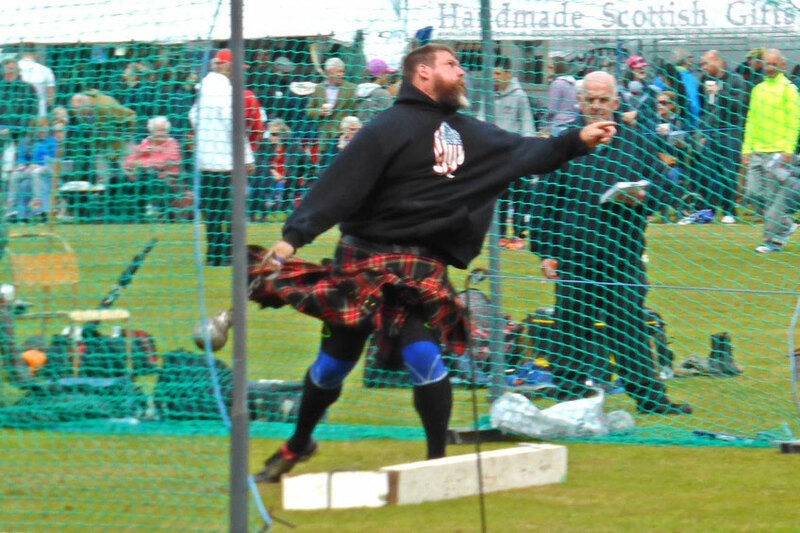 The heavyweight events include the stone put, throwing the weight, throwing the hammer, and tossing the caber. All of these events involve moving very massive things around vigorously, so all of the men we watched competing were big and heavy. 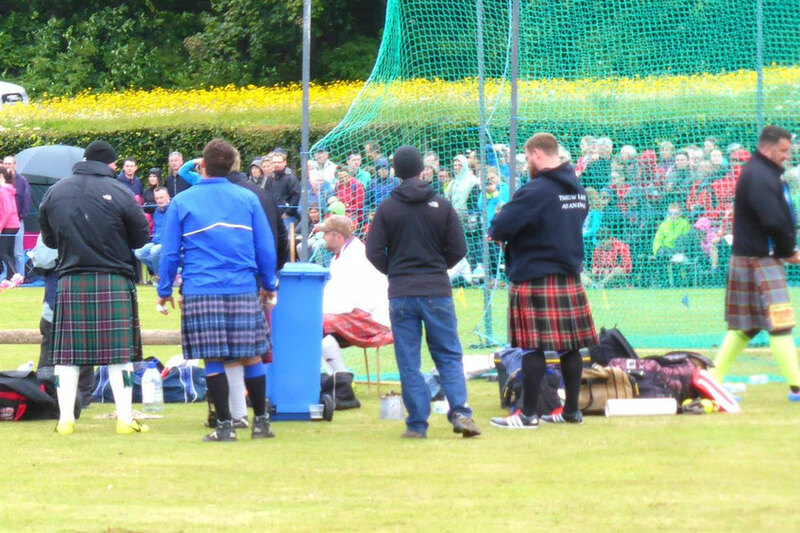 And, for authenticity, competitors in heavyweight events are required to wear a kilt. Most of the stone-put competitors did a conventional put, as I learned when doing shotput in high school. Some, however, had their own, more elaborate style. This competitor is a champion heavyweight competitor, with a very complex style that has a touch of ballet about it. 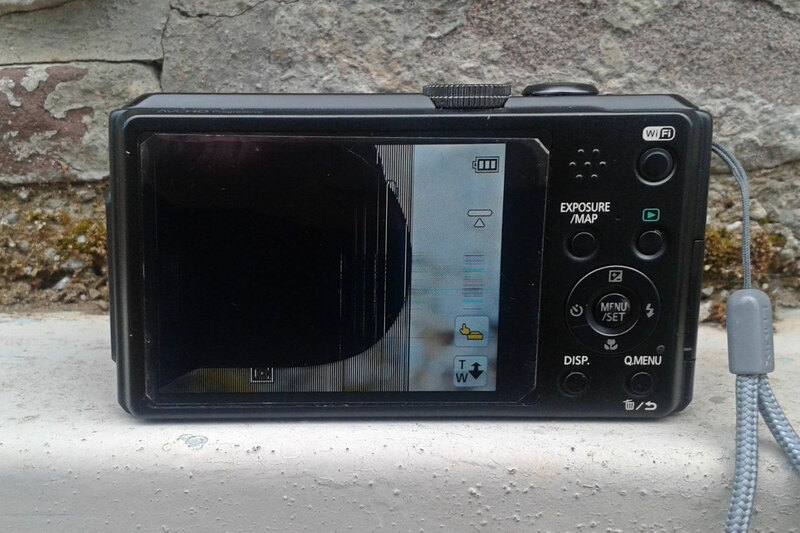 This was still reasonably usable for still photos (most of my photos of Scotland were taken with it like this), but very difficult to use when trying to video a moving subject. I made an insurance claim on it and eventually got it fixed. Next event is the weight for distance, in which a weight with a handle, or chain and handle, is thrown as far as possible. My video of the weight for distance is especially poor, but it will give you the idea of how it is done. There is also another variation called weight for height, in which the weight is thrown nearly straight up over a raised bar like a high jump bar. This form wasn't used at these highland games. It sounds dangerous to me - with the weight going nearly straight up and then straight back down again at the competitor - if the competitor loses track of the falling weight, or trips and falls and ends up under it, it could be disastrous! When doing the hammer throw the competitors have metal blades attached to the front of their shoes that they dig into the ground to stabilise themselves. Notice that these events are performed from within a safety net - losing one of these projectiles into the spectating crowd would be a really bad thing. The hammer throw is the the riskiest of these events, because all the thrower has to hold onto is the bare shaft of the hammer, and as you can see from the previous video, a huge effort goes into swinging it. One of the competitors at this event lost control of his hammer and it slammed into the ground at the edge of the safety net, hitting and bursting a water bottle. You can see that other people had lined their bags up along the edge of the safety net - they moved them after this happened! This competitor is unable to manage the caber, and loses his momentum before the toss. Notice in the foreground the start of a tug of war. You can see that this competitor has much better control of the caber; never the less, the caber falls down sideways, only pointing away from the competitor slightly, so it is only just a successful toss. The tug of war is well under way now in this video. 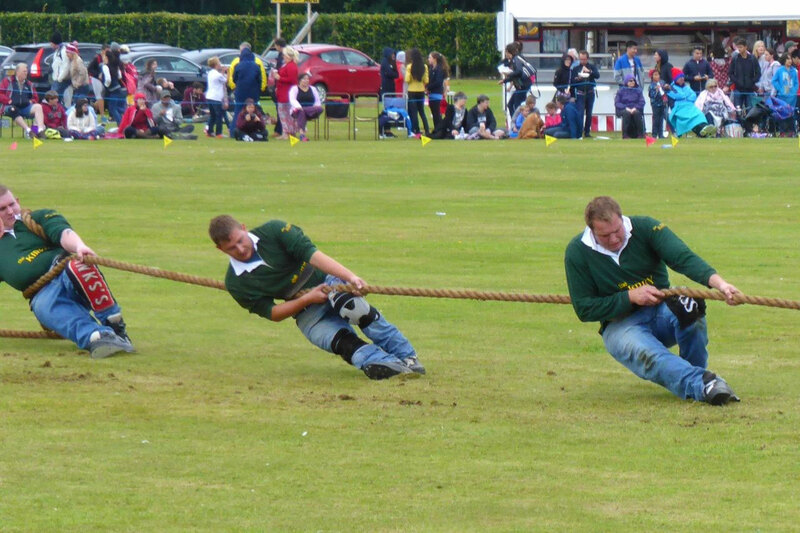 The tug of war takes a surprisingly long time to run its course; easily five, or even ten minutes. Initially the two side pull steadily in a stalemate, trying to exhaust the each other; this is the stage that they are up to in this video. Eventually one team will show signs of weakness, and then they all explode into action and the struggle really begins. In this photo you will see, if you look carefully, that the competitors have sharp-edged plates on the soles of their shoe that they dig into the soil to increase their traction. Between these plates digging in; and the stone putts, weights, and hammers coming down like cannon balls; the blades on the hammer thrower's shoes digging in; and the ends of the cabers slamming into the ground; the heavyweight events are very hard on the surface of the athletics fields!